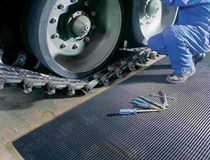 Jaymart’s range of Anti Fatigue matting and mats is the best way of keeping both your employees and your profits in good condition. Jaymart’s anti-fatigue matting has been developed to encourage foot movement in people who, for whatever reason, find themselves standing up for extended periods of time. With Jaymart’s anti-fatigue matting your people will be kept fitter, healthier, motivated and more productive. Jaymart’s anti-fatigue matting products also reduce the shock on joints when walking; some are even chemical and grease resistant, slip resistant even in wet conditions, resistant to static electricity, and what’s more, with a great range of colours and styles they look good too. So, with Jaymart’s anti-fatigue matting, your people will be able to stand - & really deliver!